According to the Hikobe Family geneaology, Takashina Asomi Kafu, the family can be traced back to Prince Takechi, the eldest son of Emperor Tenmu (? - 686). Their history is recorded as well in the Taika Reform writings of Emperor Tenji (626-672). Prince Takechi fought in the Battle of Jinshin(672) and served as the Prime Minister of Empress Jito (645-703). His son, Nagaya-o fell into the evil plot of Lord Fujiwara, a court noble, which resulted in his committing ritual suicide. According to law, the sixth generation descendant of Prince Takechi automatically forfeited aristocratic status and thus the family name became Takashina. 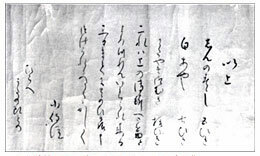 Ancient history recorded in the Manyoshu includes a poem about one of the family's forefathers. In addition, in the well-known Tale of Ise, Ariwara no Narihira and Saigu Tenko have an illegitimate child, a granddaughter of the family, who eventually enters the Palace of the Empress and becomes a consort of the Emperor. Here the writings of fiction cross over into the realm of the real world. Entering the Kamakura Era (1185-1333), the 21st generation descendent, Mitsutomo, became the local lord of the Hikobe district of Kikuta county in Mutsu Province (present day Iwate Prefecture). During this time, the family assumed the name, Hikobe. A close relative of the shogun, Ashikaga, Hikobe served as his vassal and fought in the Battle of Minatogawa. In the Battle of Miyoshi, fathers and sons died, their blood flowing freely, without regard for life or limb, just as is written in the story. Being closely associated with Lord Ashikaga, one of the characters in his name, "henki," was bestowed upon him as can be seen recorded in documents and written on fans. During the Period of Warring States (1467-1568), the father and son of the Konoe Zenshi family arrived in the Kanto area and were left in charge by Lord Uesugi Kenshin. They assumed control of Kiryu Castle. At the same time, Hikobe Nobukatsu also arrived and was appointed to take control of the Hirosawa area of Kiryu after the return of the Konoe father and son to Kyoto. In the year 1561, Lord Kiryu and Lord Yura engaged in a great battle. The Hikobe family maintained political distance from both of these vassals. In the year 1565, the head of the Hikobe family, the Imperial Court Master Musician, Harunao, and his eldest son, Terunobu, died in battle. From that date forward, the Hikobe family has maintained residence at the Hirosawa estate. After this period, much is recorded in the family history. The study of Japanese classics, poetry, pharmacy, flower arranging and other cultural pursuits befitting a gentleman farmer, became part of the family lifestyle. At one time, the manor sponsored a temple school and other educational institutions. The Hikobe family's relationship to the textile industry in Kiryu is demonstrated by a written order for textiles from a female chamberlain of Lord Ashikaga Yoshiteru. This order has been designated an Important Cultural Asset by Kiryu City. of textiles, but helped promote local textile manufacturing and were engaged in the export of goods as well. Their fortunes rose and fell with the local economy. In addition, many local leaders were chosen from among the ranks of the Hikobe family. In 1868, the first year of the Meiji Era, the 10th generation Hirosawa Hikobe descendant, Tomoyuki, began the production of black satin. In addition, "Bunka Obiji" or obi textiles woven from cotton and synthetic silk were produced at the Hikobe factory. In the early part of the Showa Era (1926-1989), the 14th generation descendent, Komao, served as a Prefectural Assemblyman and as the Chairman of the Kiryu Textile Weavers Union. He was a very distinguished and accomplished citizen. to plan a way to restore his homestaed and continue the family line, secretly preserving his family treasures.